March is a big month for birthdays in my family. Today, St. Patrick's Day, is my Mom's birthday. Happy birthday Mom!!!! We're having a party on Saturday but she can get a sneak peek at her birthday card. It's also my entry for the Compendium of Curiosities 3 Challenge #24 over at the Studio L3 blog. As per the rules, I can't share how I did this, but if you have a copy of Tim Holtz's book A Compendium of Curiosities Vol. 3 you can see the instructions on page 51. Also, many thanks to The Funkie Junkie Boutique for sponsoring Challenge #24. If you join in you could win a gift certificate to the shop! Be sure to go see all the inspiring projects created by the Curiosity Crew over at Linda's blog. Eye candy to be sure! I SO need to get that book!!! :) So pretty Lisa! LOVe your Mother's card! Great shamrock and love the rub ons! Thanks so much for playing with Remnant Rubs with us at CC3Challenge!!! Oh what a fun card!!! St. Patrick's Day is my niece's birthday too!!! I bet yoru mom loves that!!!! 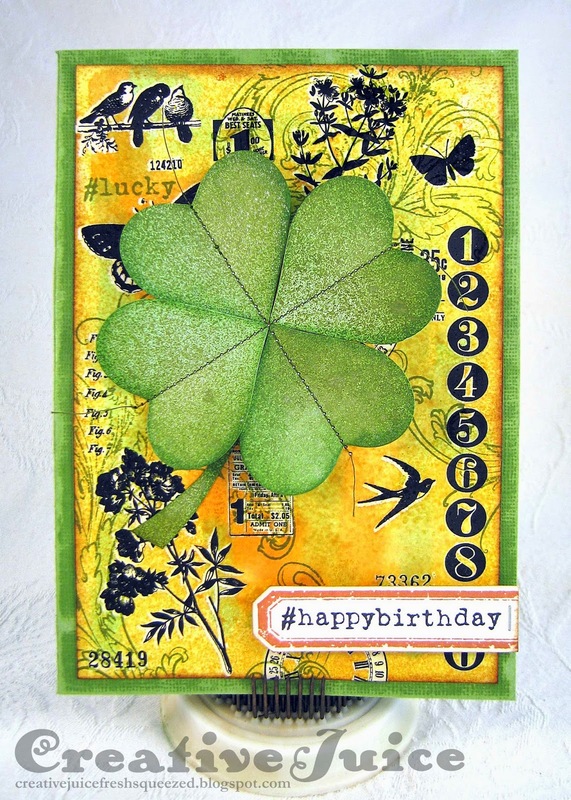 I love this Shamrock card. This is too doggone PRETTY!! My sister & 1 cousin both have birthdays on St.Paddy's, too, & since our side is Irish, we love the wearin' o' the green for that special day. Your Mom will love this! Hope the celebration was great!! What a nice birthday tribute for your mom. That touch of orange really makes the green pop. Nice use of Remnant Rubs, I'm sure your mom loved this! Thanks so much for your CC3C entries, keep 'em coming! What a great card, Lisa - I bet your mom loved it. Thanks for sharing with us at CC3C! This is such a sweet card for your mom...I know it will make her birthday extra special! Thank you for joining us at CC3!